We’ve seen some new books on information architecture hit the market in the last few years. Information architecture is not the easiest topic to write about. So, when a book comes out on the subject, we know that’s a rare event. Nevertheless, we’ve seen some new books on information architecture hit the market in the last few years. Arguably, this trend began in 2011 with the publication of Pervasive Information Architecture: Designing Cross-Channel User Experiences, by Andrea Resmini and Luca Rosati. More on that book in a future review. In this review, I’ll highlight Abby Covert’s and Andrew Hinton’s latest works. Both are veteran practitioners of information architecture and well-known contributors to the field’s body of knowledge. I’m providing these reviews to help readers find books that may match their current interests or that might prove useful in working on a related project. I also hope to encourage people who already own these books to revisit some passages from them, perhaps looking at them through a new lens or prompting constructive debate. Abby Covert is the outgoing president of the Information Architecture Institute and founder of the very popular World IA Day. She is an independent consultant and tireless advocate for information architecture who still finds time to teach design and information architecture at Parsons School of Design: The New School. Identify the mess. This means preparing for an honest assessment of the complexity you’re dealing with. While this could be uncomfortable for you or your client, it’s a necessary step that will help you establish realistic objectives. State your intent. Mean what you say—understanding what you mean as you explore who, why, and what. Face reality. Be sure to frame the scope, context, and constraints of an engagement and provide visual maps to give clarity. Choose a direction. Decide on a strategic path and explore it by considering meaningful relationships between objects, people, and places. Measure the distance. Define goals so you can measure success. Set indicators to help you stay on course and reach your goals. Play with structure. Use taxonomy, facets, and other organizing principles to reduce ambiguity. IA practitioners at all levels will benefit greatly from reading this book. How to Make Sense of Any Mess doesn’t go deeply into any one area. This helps to keep the subject matter light. And while the discussion never gets too technical, Abby still keeps the reader connected to information architecture at a meaningful level. IA practitioners at all levels will benefit greatly from reading this book. How to Make Sense of Any Mess introduces a thoughtful lexicon of terms that are worthy of scrutiny. Debating the merits of the book’s terminology could engender a healthy discourse about the curation of industry terms and concepts. 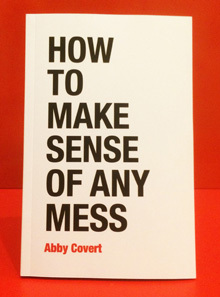 While the book’s content strategy is modest, as the author intended, How to Make Sense of Any Mess is without a doubt an ideal book from which to transition to a deeper IA conversation. How to Make Sense of Any Mess is a solid primer on the approaches information architects use in breaking down information complexity. How to Make Sense of Any Mess is a solid primer on the approaches information architects use in breaking down information complexity. If the subject of information architecture were a building, this book would be its front door. All are welcome. 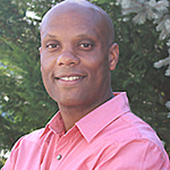 Andrew Hinton is a founder of the Information Architecture Institute and has helped to frame how we discuss information architecture for more than 15 years. Andrew is a respected voice in the IA community and often shares his research and thought leadership at the IA Summit and World IA Day. Companies of all shapes and sizes have come to realize the value of improving customer experiences through personalization and more context-aware products and services. Understanding Context, by Andrew Hinton, reveals potential factors that impact context and frames context as an embodied feature of the design of products and services. Companies of all shapes and sizes have come to realize the value of improving customer experiences through personalization and more context-aware products and services. According to Andrew, these three types of information are the interrelated layers of an environment, and they help to shape our basic human experience. Further, understanding the intermingling of language, perception, and action improves human interactions in the environments that we create. Therefore, planning the contextual scope of digital products and services is no longer a trivial act. As you connect with Andrew’s book, prepare to stimulate some new brain-cell growth. Can you say “embodied cognition”? This book explores valuable theory and provides insights into cognitive science that can help us to create thoughtful information environments. However, the deep background information that Andrew pours into the book is not for the faint of heart. While you could skip past some parts of the book, you’d only be buying time for the present. You’ll eventually end up returning to these sections to enrich your contextual vocabulary. And that will be a good thing. In addition to Andrew’s Herculean effort to frame context, he contributes brief, but thoughtful analysis of other important information-architecture concepts…. Understanding Context touches on many topics with which UX design professionals should become familiar. However, the book’s wealth of historical references, theory, and scientific dialogue will likely resonate most with more senior IA practitioners and academics who want to build deep subject-matter expertise in complex multi-channel information environments. Andrew ultimately posits that “the central concern of information architecture is how information creates environmental structure and supports environmental understanding.” Of course, you’ll have to read the book to really appreciate this point—or repeat it in public with confidence. It’s also important to mention that Andrew’s definition of information architecture attempts to improve upon the 2002 IA Institute definition, and he presents a respectable argument for his definition. Lastly, Andrew does not provide a formal lexicon or glossary of terms. But he does go the extra mile in explaining his core concepts. In the future, I hope academics, students, and the intellectual community around information architecture will investigate the book’s key concepts. You’ll find seeds for constructive dialogue evenly distributed throughout the book. 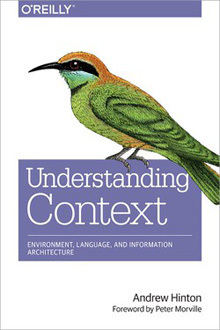 Understanding Context thoroughly investigates how information architects and designers of products and services can anticipate the challenges that situational context presents. Understanding Context thoroughly investigates how information architects and designers of products and services can anticipate the challenges that situational context presents. The physical, cognitive, and environmental factors that influence the integrity of any environment are significant. Context is dense with information and affordances that we can manipulate to varying degrees. Andrew does a commendable job of exploring from the center out to the edges of this topic, in a way that is revelatory as well as actionable for practitioners at all levels. How To Make Sense of Any Mess and Understanding Context are reliable sources of actionable information for information architects and UX designers. Read them through more than once, then refer to them as often as you need to. As you do, you’ll be sure to benefit from the wisdom they impart through each encounter.